If you’ve spent much time in the deep depths of the internet car culture, you’ll know there’s nearly an infinite supply of fake DeLorean time machines. Some are better than others of course, but it’s still always fun to picture yourself tooling around in one of the most famous movie cars of all time. 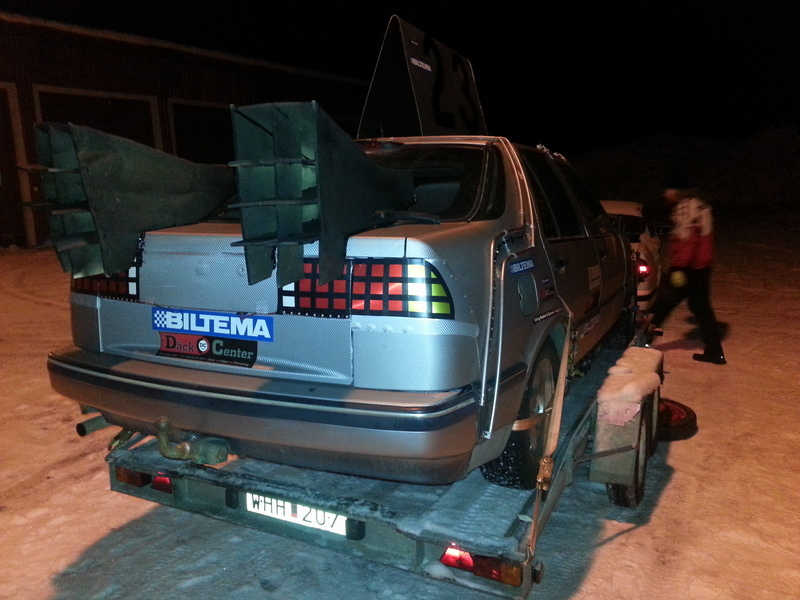 That is what Umeå Gatbilars decided to do for their 2013 entry into the Swedish equivalent to the 24 Hours of LeMons, The Knuffar Cup. 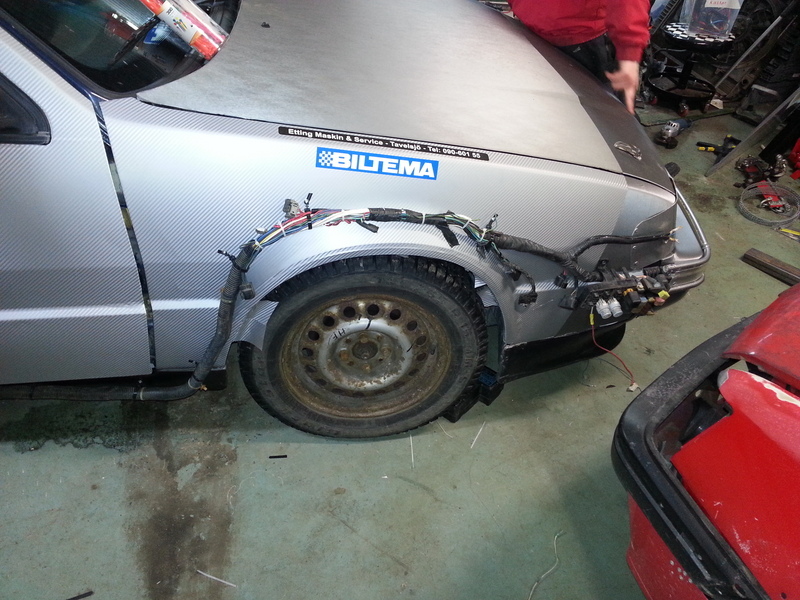 Imagine a banger class 3hr enduro race in the snow, with the entire team INSIDE the car. 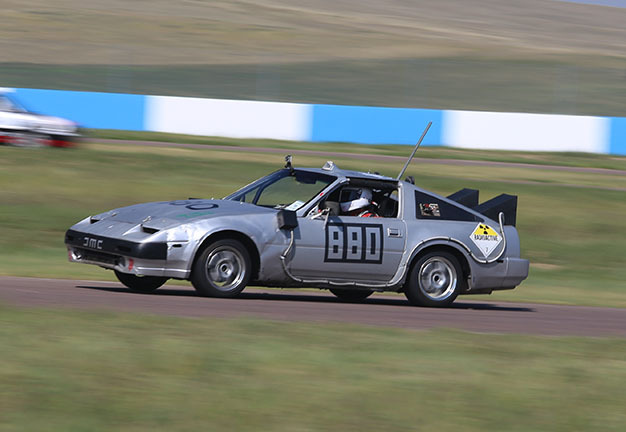 Anyway, the Swedish car club thought to themselves, hey this theme isn’t tired OR played out, so lets grab a local car and DeLorean it. 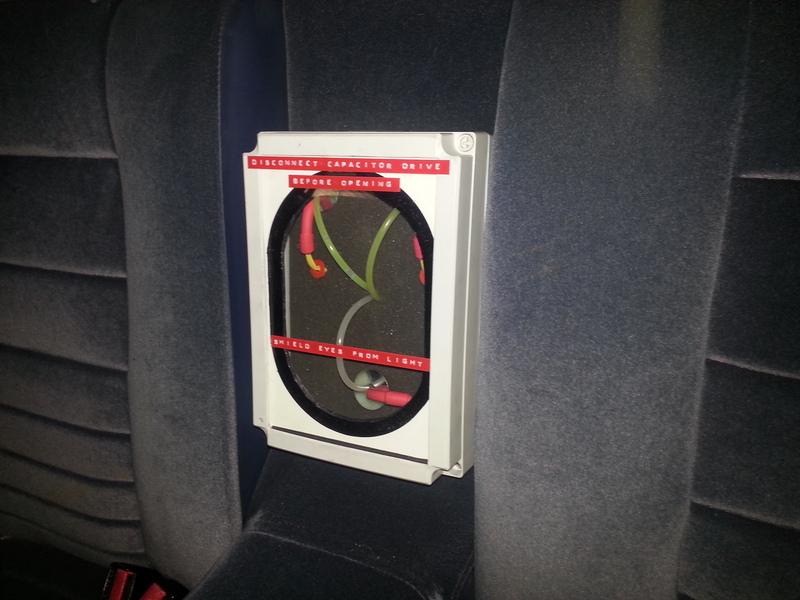 From this terrible idea, the best/worst BTTF time machine will be born. 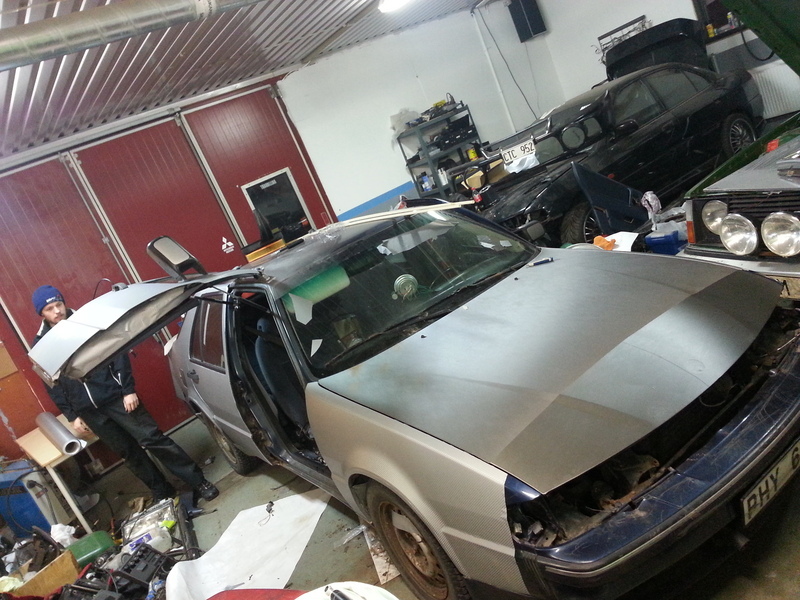 Of course being Sweden, I assume there are only SAABs and Volvos to choose from, so the team bought this SAAB 9000 for a few Kronor and got started looking for sponsors for scrap steel and soup. First thing on the build schedule is obviously to cover the entire car in stainless steel bodywork, but of course brushed stainless isn’t cheap. The team would have to settle for brushed stainless steel vinyl wrap, but only got one roll before realizing Christmas was coming up and they needed money to buy presents. Downgraded once again, the car would end up being mostly covered in carbon fiber vinyl, but at least it’s silver. B, moving on. 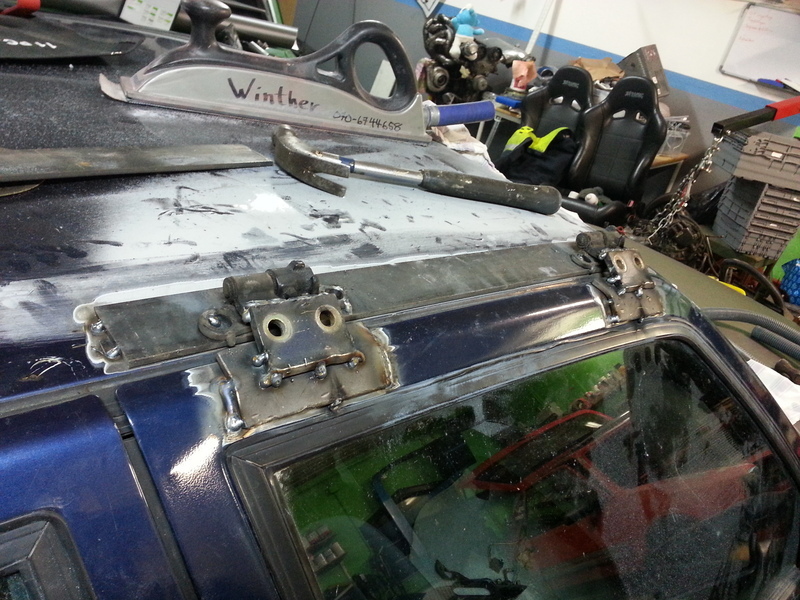 Time to add the rest of the bodywork, and cover the headlight sockets that wont be used with thin sheet metal. Hastily draw some DeLorean-esq lenses on, and begin with the final accoutrements. 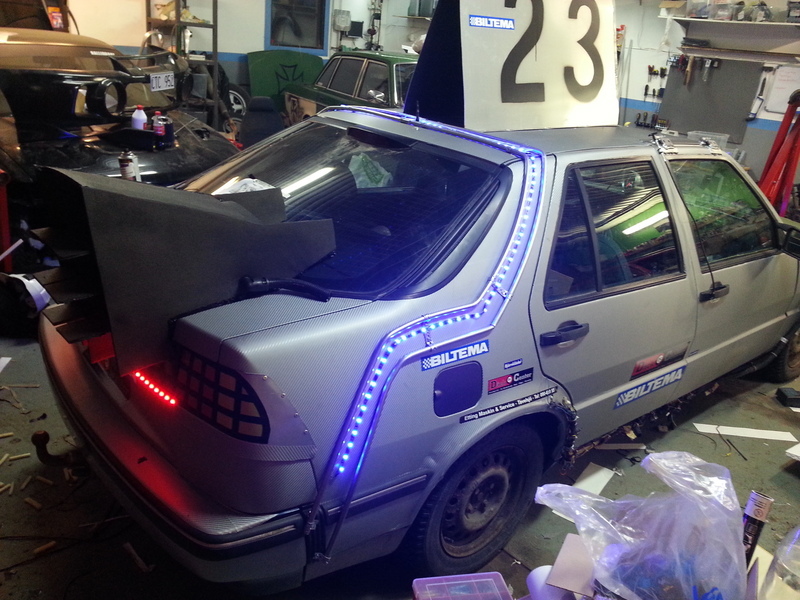 IE ropelight all the things, add thrusters, ziptie on the ever important technical shizzle whizzle (including flux capacitor), and toss on the ever important race number plate. BAM, you now have a time machine ready to run the Knuffar Cup, where nearly all these things will be summarily torn off and scattered over the snowy course. If you’ve never seen this before, take a look at the video linked below, made by another team fielding a Volvo. How much does this make you want to move to Sweden? Today we salute you Knuffar Cup competitors. A+, great job. This is the Google Translate version of the final post in the build thread, which can be found HERE. “I was a bit bored so I sat down and pondered a bit on our time travel possibilities. As everyone knows, it requires 1.21 gigawatts of electricity to travel through time, the simplest thing would be to get some plutonium and build a reactor. However, this is 2013, and plutonium is a bit difficult to get hold of, I’m sure that in the future you can buy plutonium at their local hardware store, but it does not help us right now. Another option is to build a fusion reactor called a “Mr. Fusion” and they would be really good for it does not require as much mass to get large amounts of energy, but then we come to the small problem that the only direct successful fusion humanity has managed so far is the hydrogen bomb. Even if we manage to build one, I do not think we get to keep it. Then there is the sun of course, but it is far too unreliable source of power so we will have to start thinking a little more conventional courses and here we have really a bit of luck as we have a fairly large power station nearby. Stornorrfors has a maximum power output of 591 megawatts and a normal annual production of 2290GWh which would mean that we could upload our flux capacitor in an afternoon. Since I’ve already met our test pilot (who asked to remain anonymous) for the first time travel, I know also that Vattenfall agreed to this on a sticker on the car, unfortunately, the decal was not time-resistant so it disappeared in the journey..
Looks Like a lot of FUN !! A real contact sport . I liked the fact that there were at least 3 people in the car . Looks like more fun than Rally X . Totally agree here! Going too slow to do any real damage with the contact (although a HANS might still be a good idea), we would enter a race like that around here in a heartbeat!